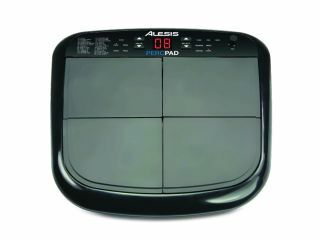 NAMM 2011 PRESS RELEASE: Alesis, a leading manufacturer of professional audio electronics and musical instruments, announces PercPad, the first four-pad electronic percussion instrument. The PercPad's four velocity-sensitive pads with kick input, high-quality internal sounds and compact size make it the perfect choice for drummers and other instrumentalists looking to incorporate electronic percussion into their setups. Drummers can mount the PercPad on a standard snare drum stand or mount it to stands and racks using the Module Mount, sold separately. The PercPad has a collection of acoustic and electronic drum and percussion that are perfectly suited to the needs of drummers and percussionists. Drummers can easily tune and edit sounds, assigning them to any of the four pads or to the kick input. They can also expand their sound pallete using the PercPad's MIDI output, enabling them to perform with the sounds from any MIDI sound module or software on Mac or PC. Drummers can use the PercPad with virtually any switch or velocity-sensitive kick trigger or pad including Alesis' DMPad and RealHead Kick Pads. Musicians can connect the PercPad to amplifiers, PA and recording systems with the standard dual 1/4-inch outputs, and they can monitor on their favourite headphones. "There's never been an ultra-compact multi-pad instrument like the PercPad before," Dan Radin, Product Manager, Alesis. "It's the perfect addition to any acoustic kit."